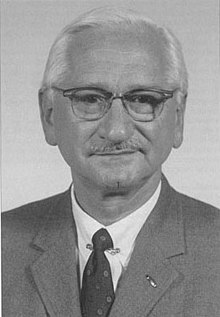 Albert Bruce Sabin (born Abram Saperstein; August 26, 1906 – March 3, 1993) was a Polish American medical researcher, best known for developing the oral polio vaccine, which has played a key role in nearly eradicating the disease. Sabin was born in Białystok, Poland, then part of the Russian Empire, to Polish-Jewish parents, Jacob Saperstein and Tillie Krugman. In 1921, he emigrated with his family as Abram Saperstejn on the S/S Lapland which sailed from Antwerp, Belgium, to the Port of New York. In 1930, he became a naturalized citizen of the United States and changed his name to Sabin, as well as assuming the middle name Bruce. In 1969–72, he lived and worked in Israel as the President of Weizmann Institute of Science in Rehovot. After his return to the United States, he worked (1974–82) as a research professor at the Medical University of South Carolina. 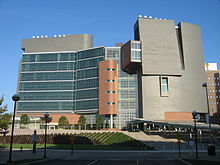 He later moved to Washington, D.C. area, where he was a resident scholar at the John E. Fogarty International Center on the NIH campus in Bethesda, Maryland. With the menace of polio growing, Sabin and other researchers, most notably Jonas Salk in Pittsburgh and Hilary Koprowski and Herald Cox in New York City and Philadelphia, sought a vaccine to prevent or mitigate the illness. The Sabin vaccine is an oral vaccine containing weakened forms of strains of polio viruses. In 1955, Salk's "killed" vaccine was released for use. It was effective in preventing most of the complications of polio, but did not prevent the initial intestinal infection. The Sabin vaccine is easier to give than the earlier vaccine developed by Salk in 1954, and its effects last longer. Sabin first tested his live attenuated oral vaccine at the Chillicothe Ohio Reformatory in late 1954. From 1956–1960, he worked with Russian colleagues to perfect the oral vaccine and prove its extraordinary effectiveness and safety. The Sabin vaccine worked in the intestines to block the poliovirus from entering the bloodstream. In the intestines, Sabin had discovered, the poliovirus multiplied and attacked. Thus, the oral vaccine broke the chain of transmission of the virus and allowed for the possibility that polio might one day be eradicated. Between 1955 and 1961, the oral vaccine was tested on at least 100 million people in the USSR, parts of Eastern Europe, Singapore, Mexico, and the Netherlands. The first industrial production and mass use of oral poliovirus vaccine (OPV) from Sabin strains was organized by Soviet scientist Mikhail Chumakov. This provided the critical impetus for allowing large-scale clinical trials of OPV in the United States in April 1960 on 180,000 Cincinnati school children. The mass immunization techniques that Sabin pioneered with his associates effectively eradicated polio in Cincinnati. Against considerable opposition from the March of Dimes Foundation, which supported the relatively effective killed vaccine, Sabin prevailed on the Public Health Service to license his three strains of vaccine. While the PHS stalled, the USSR sent millions of doses of the oral vaccine to places with polio epidemics, such as Japan, and reaped the humanitarian benefit. Indeed, it was not clear to many that the vaccine was an American one, financed by U.S. dollars, as it was not widely available to ordinary Americans. Sabin refused to patent his vaccine, waiving every commercial exploitation by pharmaceutical industries, so that the low price would guarantee a more extensive spread of the treatment. From the development of his vaccine Sabin did not gain a single dollar, and continued to live on his salary as a professor. The Sabin Vaccine Institute was founded in 1993 to continue the work of developing and promoting vaccines. To commemorate Sabin's pioneering work, the institute annually awards the Albert B. Sabin Gold Medal in recognition of work in the field of vaccinology or a complementary field. ^ Moreno, Barry (4 October 2017). "Ellis Island's Famous Immigrants". Arcadia Publishing. Retrieved 4 October 2017 – via Google Books. ^ "The Legacy of Albert B. Sabin - Sabin". www.sabin.org. Retrieved 4 October 2017. ^ "Albert Sabin Biography - life, children, parents, death, school, information, born, college, siblings, time". www.notablebiographies.com. Retrieved 4 October 2017. ^ Brown, Emma. 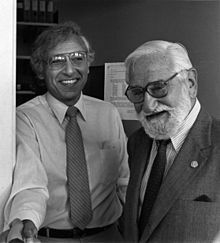 "Robert M. Chanock, virologist who studied children's diseases, dies at 86", The Washington Post, August 4, 2010. Accessed August 9, 2010. ^ Jiménez, Marguerite (June 9, 2014). "Epidemics and Opportunities for U.S.-Cuba Collaboration". Science & Diplomacy. 3 (2). ^ Sabin A.B. (1987). "Role of my cooperation with Soviet scientists in the elimination of polio: possible lessons for relations between the U.S.A. and the USSR". Perspect Biol Med. 31 (1): 57–64. doi:10.1353/pbm.1987.0023. PMID 3696960. ^ Benison S (1982). "International Medical Cooperation: Dr. Albert Sabin, Live Poliovirus Vaccine and the Soviets". Bulletin of the History of Medicine. 56: 460–83. ^ "News - Special Reports - Albert B. Sabin -- National Medal of Science 50th Anniversary - NSF - National Science Foundation". www.nsf.gov. Retrieved 4 October 2017. ^ Bonfield, Tim (July 5, 1999). "Sabin has been snubbed before". The Cincinnati Enquirer. Gannett Company. Retrieved October 11, 2015. ^ "Albert Sabin Way to be dedicated". University Currents. www.uc.edu. April 21, 2000. Archived from the original on June 7, 2010. Retrieved March 7, 2016. ^ USPS press release Archived 2006-09-30 at the Wayback Machine. ^ "Capitol Square Foundation press release". Retrieved 4 October 2017.